Size: A female specimen measured had a body height of about 3.5 cm, with a carapace of 6 cm in width and 5 cm in length. 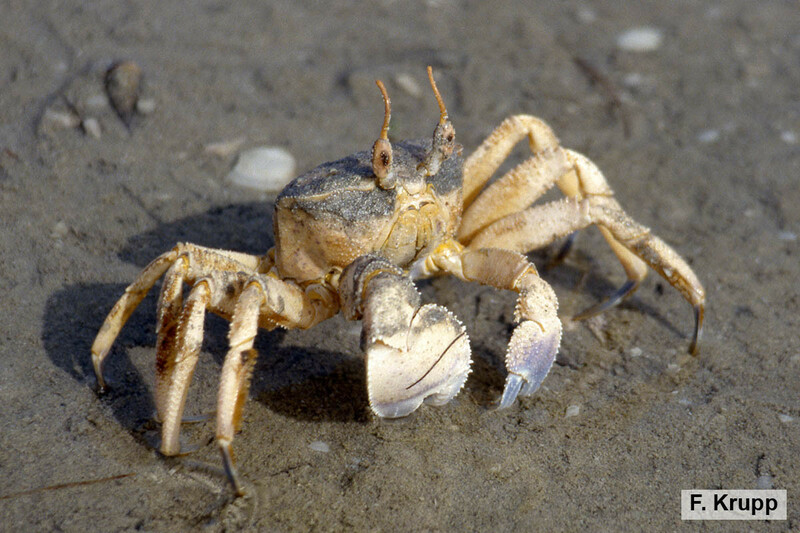 The Ghost Crab inhabits simple to complex deep burrows in the intertidal zone of sand beaches, for which it is a key species, and occurs more commonly on offshore islands. The burrows are dug in the supralittoral zone, the area above the spring high tide line that is regularly splashed, but not submerged by ocean water. Males build towers of sand during the breeding season. The animals are seldom seen, as they are primarily nocturnal and only emerge from their burrows to forage at dusk; they are fast-moving generalist scavengers and predators of small animals. The scientific name of the genus means ‘swift-footed’ and the common name of the species refers to its nocturnal habits and pale color, or possibly to its ability to disappear suddenly. The species is found in the northwestern Indian Ocean, from the southeastern coast of the Arabian Peninsula (Oman) through the Arabian Gulf to northern India (northern Gujarat State). Ocypode rotundata is the only species of the genus occurring in the Arabian Gulf and the Gulf of Oman, and all other records of the genus from this region are actually misidentifications. Ocypode rotundata has not yet been assessed for the IUCN Red List of Threatened Species. Ghost Crabs have a deep box-like body with a gently convex dorsal surface. The carapace is squarish, wider than long, but has arched and rounded anterolateral margins that make it look less distinctly four-sided. 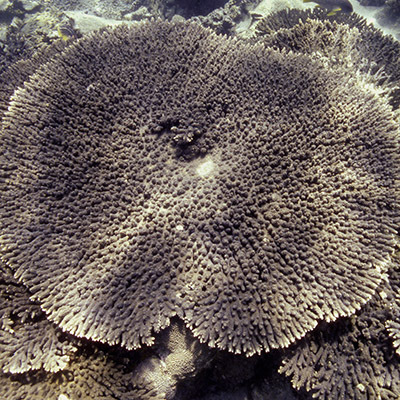 It is densely covered with coarse tubercles, less so toward the lateral sides. The eyes are rather large and elongate, they occupy the lower portion of long and thick eyestalks, which extend distally beyond the cornea and are tipped with a horn-like projection (stylus). The claw-bearing legs (chelipeds) are shorter than the walking legs and unequal in size, with one much larger than the other in both males and females. The smaller cheliped is pointed at the tip; the larger cheliped has a broad palm that possesses a stridulating (sound-producing) ridge on the inner surface. This stridulating organ is much shorter than half the greatest height of the palm and composed of 10 15 irregularly spaced elongate tubercles with striae (smaller ridges), each of them consisting of granules. The last pair of walking legs is shorter and thinner than the other pairs. Coloration is generally pale, to blend in with the sand, although it can be gradually changed to match the environment.